November favourites are here and I have been loving a couple of items this month, I really wanted to include my Colourpop bits but I think it’s a bit too soon so it might pop it in next month’s favourites. Starting with the base I repurchased the EX1 Cosmetics Invisiwear Liquid Foundation in a lighter shade since I am paler in the winter months and the launched new shades to their collection. I have been loving the flawless matte finish this gives me and the colour is perfect for my skin tone right now. I do have to put on a hydrating primer with this as my skin has become dry. I have done a full review on the EX1 Cosmetics Foundation before new shades where launches so feel free to check that out. A balm that has been helping the dry skin around my eyes is the Dr Paw Paw Moisturizing balm. It is suitable for sensitive skin and really soothes any irritation you have especially on such a sensitive area. I apply this day and night and it has been helping my eyelids soo much. I regret not using this earlier and it can be applied to any part of the skin and lips. A foundation I have been loving the second half of the month is the L.A. Girl HD High Definition Longwear Illuminating Foundation which I have written a full review here. I love the flawless dewy/healthy finish this gives me and it is also perfect my yellow skin tone. I do need to use a mattifying primer or cream underneath to combat with my combination skin which consists of an oily t-zone and dry skin. This is the one I have been reaching for the most out of the two. My most reached for eyeshadow palette is the Morphe Brushes 35F. This really is a perfect palette for these autumn/winter days where we are more daring to opt for a heavier eyeshadow look, I love the metallic and shimmer finishes of all these shades and how pigmented they are when they are on the eyes. It is a perfect gift for anyone who loves eyeshadow palettes as much as me. I have done a full review here and where you can get this in the UK. I got my hands on the Laura Mercier Illuminator in Spellbound which is a highlighter. It is a really beautiful rose gold shade on me. It is buildable and natural depending on how much you apply and last all day on me. This has been my most reached for highlighter since it arrived on my doorstep. Lastly to conclude I have been loving the Gerard Cosmetics Slay All Day Setting Spray in Peach. I nearly gave up on the Slay All Day Setting Spray collection when I purchased the scent Jasmine - it definitely is potent – if you have a sensitive nose like me do not opt for the scent Jasmine since it smells like you been attacked by a bunch of wild flowers. Peach smells wonderful and fruity and I love the flawless appearance I get when I use this settings spray. So far I recommend the scent Green Tea and Peach. That is all for my favourites this month, what are your favourites? The morphe palette looks great! I actually ordered three morphe palettes during their blowout cyber monday / black friday sale and I'm so excited for them to get here! This post just made me more excited since they seem to be on a lot of bloggers' ride or die lists! Great post! Really want to try LA Girl. That highlighter is absolutely stunning. 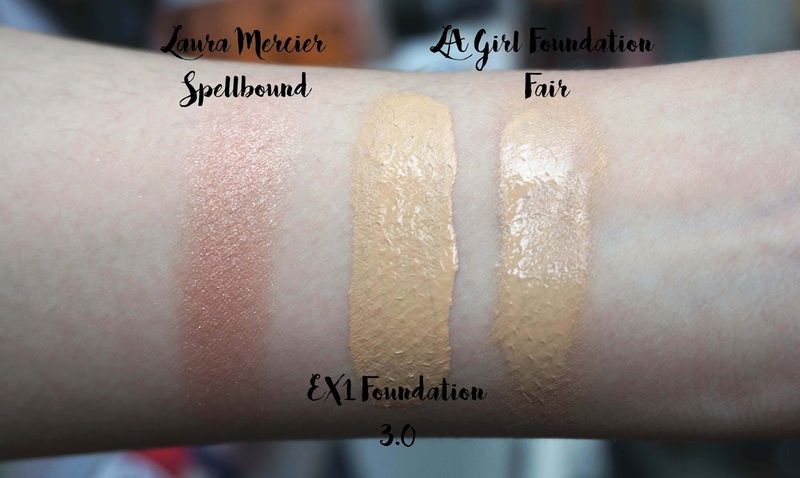 I'm going to try some LA Girl products out over the new year, I've heard so many amazing things about that foundation!